A delightful three bedroom home with thoughtfully planned accommodation. Located on our new Woodfield Place development, The Kinlet has a modern kitchen with a dining area and a separate lounge. On the first floor the master bedroom features and en-suite. 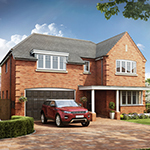 With a stylish interior specification, this home can now be reserved off-plan.